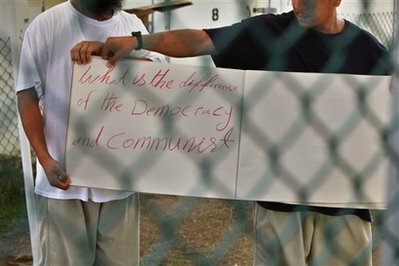 The prisoners — two of the 17 Uighur prisoners at Guantánamo (Muslims from China’s oppressed Xinjiang province) — are still held at the prison, despite having convinced the Bush administration (through a humiliating court defeat) to drop its claims that they were “enemy combatants,” and despite the fact that District Court Judge Ricardo Urbina ordered their release into the United States last October. Judge Urbina based his ruling on several important facts — that the men could not be returned to China because they faced the risk of torture (or worse), that no other country had been found that was prepared to risk the wrath of China by offering them a home, and that holding innocent men at Guantánamo was unconstitutional — but a notoriously reactionary appeals court overturned his ruling in February, and last week the Obama administration sought to prevent the Supreme Court from reviewing their case by agreeing with the appeals court judges. This was in spite of the fact that, on various occasions since January, the administration has also suggested that it was prepared to move at least some of the men to the United States, if for no other reason that one of solid pragmatism, in that doing so would almost certainly encourage European countries to accept some of the other prisoners at Guantánamo who cannot be repatriated (because they too are from regimes with bleak human rights records, including Algeria, Libya, Tunisia and Uzbekistan). As the Obama administration dithers, the Uighurs — and one Algerian, Sabir Lahmar, who was cleared for release by a judge in November, but has similar fears to the Uighurs — are held in Camp Iguana, a separate part of the prison from the other 221 prisoners, where they are allowed privileges denied to the other inmates, including the crayons and sketch pads they used on Monday to bypass the Pentagon’s prohibition on allowing journalists to speak to prisoners. 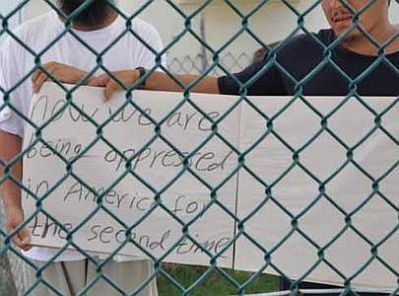 Shephard also pointed out that the reporters were ”forbidden from sending photos or video footage of the signs until Guantánamo officials received clearance from the White House,” because the Pentagon’s rules “stipulate that images of detainees must be pre-screened and cannot identify the captives due to regulations in the Geneva Conventions prohibiting the exploitation of prisoners of war” (a rule which, I feel compelled to add, is rather hypocritical, given that, just a month after the prison opened, President Bush issued an executive order establishing that the Geneva Conventions did not apply to prisoners seized in the “War on Terror,” and that serious doubts about the prisoners’ treatment remain to this day, despite a review conducted in Obama’s first month in office, which found that the prison was run humanely and in accordance with the Geneva Conventions). Shephard also explained that clearance from the White House “didn’t come until about 14 hours later,” and added that the reporters were also kept in the dark about the suicide, only being informed, by email, as their flight landed in Maryland. This is a segment from D. A. Pennebaker’s film, Dont Look Back (a documentary on Bob Dylan’s tour of England in 1965). In the film, Dylan holds up cue cards for the audience with words from the song on them. While staring at the camera, he flips the cards as the song plays. Interestingly, there are intentional errors throughout the video. For instance, the song’s lyrics say “eleven dollar bills,” but the poster says “20 dollars”. The video takes place in an alley behind The Savoy Hotel in London where poet Allen Ginsberg makes a cameo appearance. 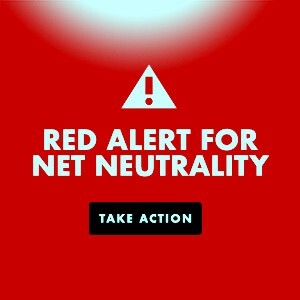 This entry was posted in All Posts News Politics and-or Videos, Dandelion Salad Featured Writers, Dandelion Salad Videos, Gitmo, Music, Musicians - Bands, Photography, Politics, Protests and tagged Activism - Protests - Boycotts, Andy Worthington, Bob Dylan, Bob Dylan on Dandelion Salad, dylan-bob, Music-Musicians-Bands on Dandelion Salad, Uighur, Uyghur, Worthington-Andy. Bookmark the permalink. It is now obvious that even though Obeyme has children, he lacks balls.